This is an excellent little book. 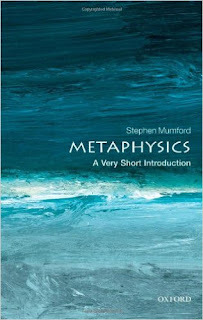 Metaphysics can be opaque and this book takes the veil off some of the mystery without degrading the discipline. If you are married to a philosopher and think that talking about tables and chairs the way your spouse does is insane and irrelevant, then this book is for you. If you are a freshman who just got yourself an introduction to metaphysics but wished it was more introductory then this book is for you. If you are a highly decorated metaphysician but have forgotten how to explain what you do to the uninitiated this book will help. Stephen Mumford's skill lies in navigating a path with many wormholes pointing them out without disappearing down one of them. His resistance to temptation is laudable and we are grateful.